St.Valentine’s Day is almost here and I have been having fun making little valentines for my husband and leaving them around the house to surprise him. This is the first time I have done this and it has been fun. Some are just simple little valentines from the Avery website that I customized and printed on 2″x 2″ Avery labels or on postcards. Others have been a little more involved. 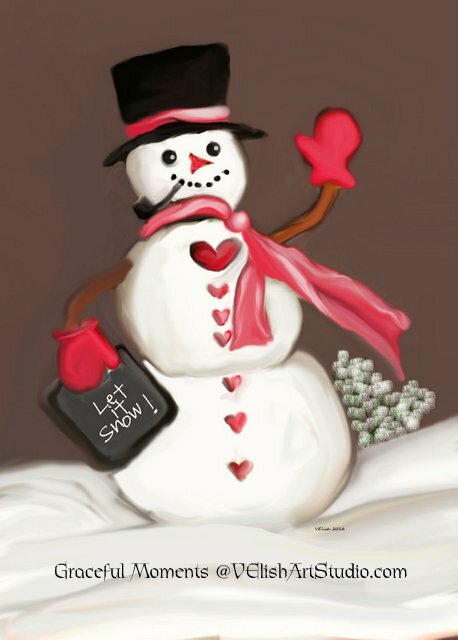 One of his early valentines started with this little snowman that I painted on sketch paper a few years ago. I came across it while cleaning my office before Christmas and cut it out and glued it to a piece of mat board and added some snow and a few other details and stuck it in a little frame. Anyway, I wanted to leave it out for winter because I usually leave all of my snowman decorations out for winter since they are not really Christmas decorations. 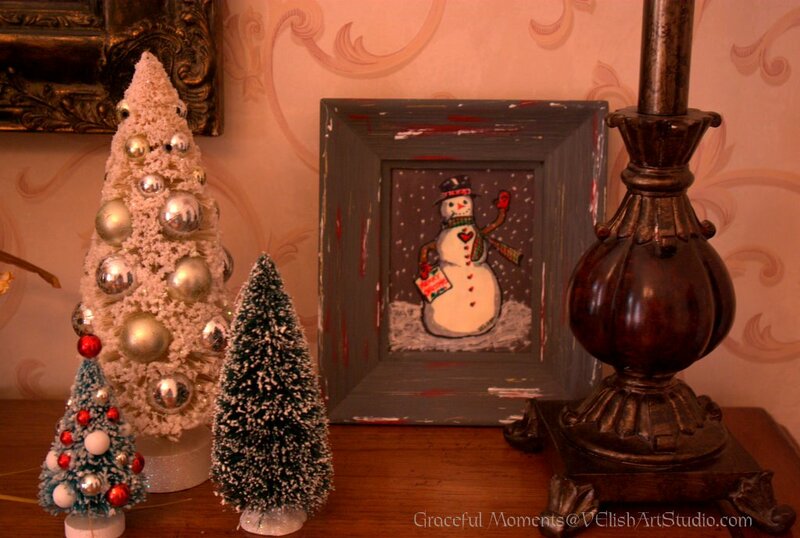 But, I noticed that I put “Merry Christmas” on the little sign this little snowman was holding. I didn’t really care. I left him out anyway. 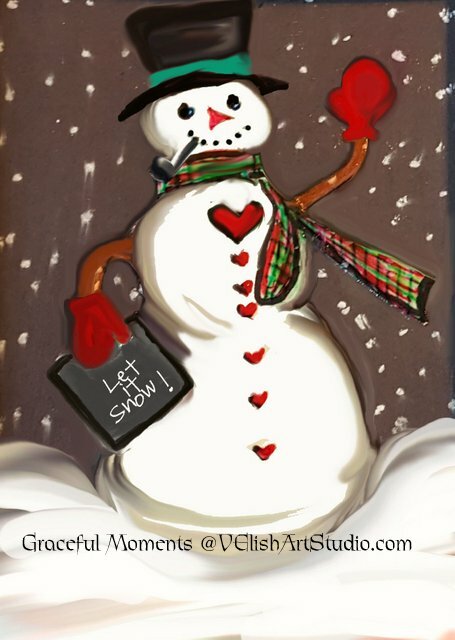 But, I wondered how easy it would be to alter the little sign and I photographed him, uploaded him to Photoshop to change his sign to “Let it Snow” and realized he was really pretty messy up close, Don’t get me wrong. I love him, as is, in the frame, but I was thinking about turning him into a valentine snowman and he wouldn’t quite do for that. not quite there, I continued to change things up. 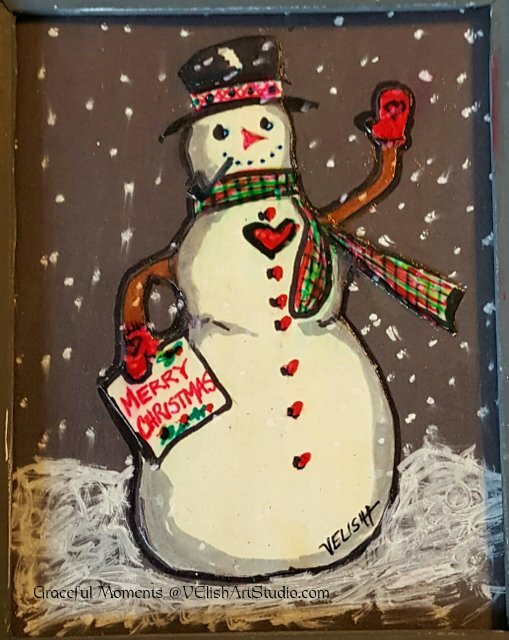 I added the “Let it Snow” and started experimenting with color. He was still looking very much like Christmas, so I was trying different things. I liked the plaid but there was really no way to change the colors and keep the plaid because there were so many shades of red and green and no definitive lines, The color replacement feature in Photoshop would have taken a few years to match and change each color. The plaid had to go. I wanted some little something else. So, I added a little snow covered shrub and decided it was finished. So this is Snowman #1 and you can download or print him here. 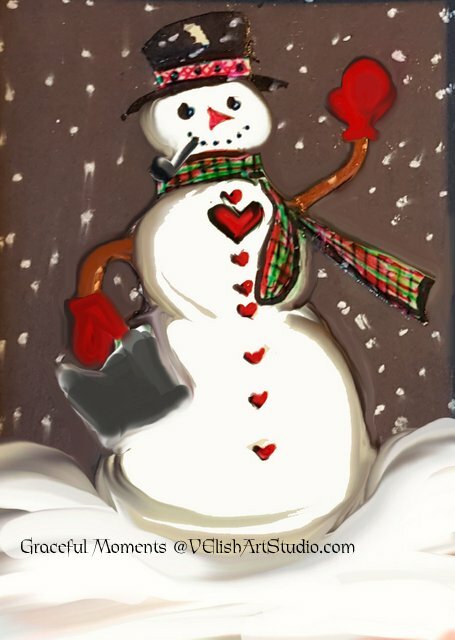 Then, since it was fun and I had some time, I took an earlier version and added a tree instead of a shrub and some falling snow and some piled up snow and an icicle or two to his hat and other parts. It is a little bit busier than the other one but still fun. So, if you like this one, Snowman #2 can be downloaded and/or printed here. The next thing was to make a valentine out of it. 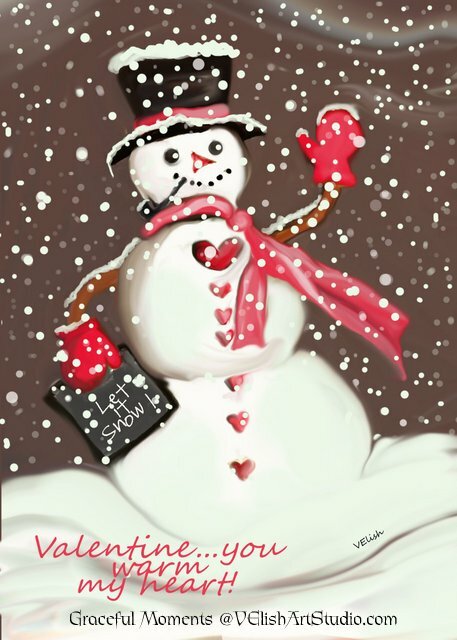 I used the a snowy version without the tree for that and simply added a valentine greeting to it. I printed it on a little scalloped edge card (apparently no longer available from Staples) and propped it up against the ice maker in the freezer. When my husband went to fill his glass with ice, he was surprised to find another little note of love. I think he is getting a kick out of all these little surprises I am leaving him. I am too. 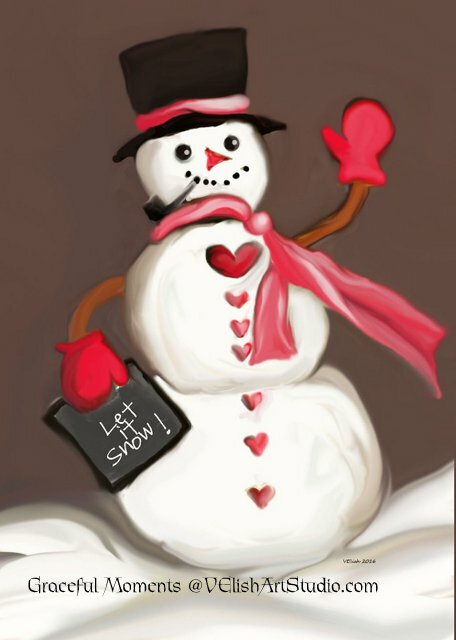 The valentine version, Snowman #3 can be downloaded and/or printed here. 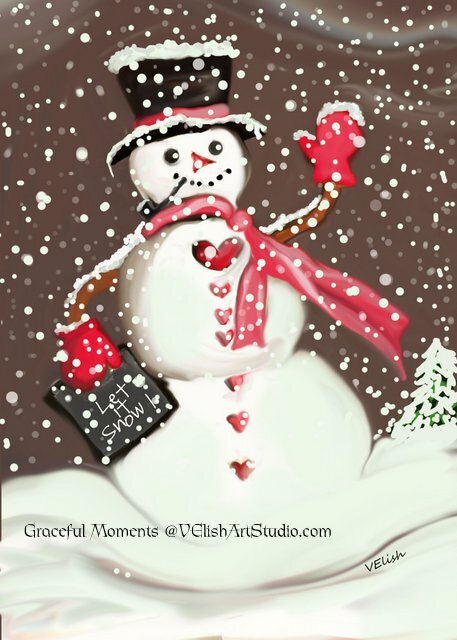 Hope you have enjoyed seeing all of the iterations this little snowman went through. Let me know if you decide to try my little pre-Valentine’s Day surprises on your spouse or kids. These free printables are provided to you as a gift. They are for your personal use only. They may not be reproduced in any medium for the purpose of profit, commercial use or sale. All images are the copyrighted work of Vicki Elish and all rights are reserved. If you would like to inquire about license for commercial use, please contact me by email. Thank you.